Nearly all little girls are fascinated with princesses and dream of living in their own castle, surrounded by beautiful dresses and furniture. For the little princess who has everything, the Levels of Discovery Princess Toy Box Bench is the perfect solution for storing all of her royal treasures. Built to look just like a real "princess" throne, your little one will be thrilled with this addition to her playroom. 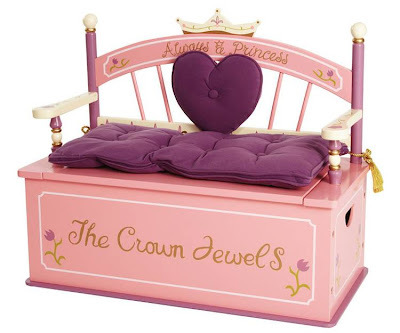 From the "Always a Princess" collection by Levels of Discovery, this adorable toy box will turn her bedroom into a royal palace. And with its comfy padded seat, her toy box doubles as a place to snuggle up with a good book. Safety: The Princess toy box bench is manufactured with a slow-closing safety hinge that prevents the cover from closing suddenly and causing injury. Commendations: The Levels of Discovery Princess Toy Box Bench has been awarded the "Baby & Children's Product News 1st Place Winner in Toy Chest Category"
Age Recommendations:The Levels of Discovery Princess Toy Box Bench is recommended for children age three to eight. You can find the Levels of Discovery Princess Toy Box Bench right here at A Kid Place. In addition, you will find "Always a Princess" table and chair sets, rockers, and other accessories for the playroom or bedroom. Outfit your little girl's space with these adorable, affordable, high-quality pieces just in time for the holidays. For over a century, Schoenhut has been the top name in children's musical instruments, and is particularly known for its high-quality toy pianos. Albert Schoenhut, the company's founder, was born in 1848, in Wurtenberg, Germany, to a family of toy makers. His family was renowned for producing beautifully crafted rocking horses, dolls and wagons. As a child, Albert was fascinated by pianos and began making toy pianos at home; in the beginning, he built them using glass sounding bars, rather than the strings used in conventional pianos. Unlike other toy instruments at the time, Albert's pianos really worked and stayed in tune; sheet music was sold with the pianos so that children could learn to play. In 1866, a buyer from the famous Wanamaker's department store brought the 17-year old Albert to Philadelphia to put his talent to work repairing glass sounding bars on toy pianos that had been damaged while in transit across the Atlantic. Eventually, Albert decided to found his own toy piano business; in 1872, he opened the Schoenhut Piano Company. Other instruments, including drums, ukeleles, xylophones and banjos soon joined the line of children's pianos, and Schoenhut Piano Company grew to be the largest toy company in the United States by the time of Albert's death in 1912. 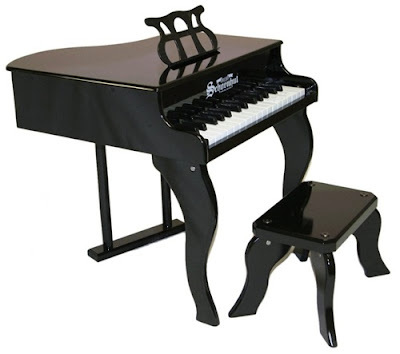 Today, Schoenhut Piano Company is owned by the Trinca family of Florida and retains its reputation as a manufacturer of the highest quality children's musical instruments; Schoenhut has won numerous awards for the top toys in America. Along with the original toy pianos designed by Albert Schoenhut, the company has branched out to offer numerous models, always pitch-perfect and lovingly designed. Learning to play a musical instrument is relaxing and stimulates the mind, making a toy piano the perfect outlet for a child's creativity. You can find toy Schoenhut pianos to help young children learn motor control, then move up to a more sophisticated instrument that grows with your child. From the old-fashioned spinet style to a real "baby grand," Schoenhut has affordable models for all ability levels - even a durable piano perfect for use in a daycare setting. Give your kids the gift of music this holiday season with the gift of a toy piano from A Kid Place. You are sure to find the perfect instrument for your budding Chopin, as well as a variety of drums and guitars for the young musician. Founded in 1968 by a team of engineers, Kidkraft is synonymous with quality, durability, and eye appeal. 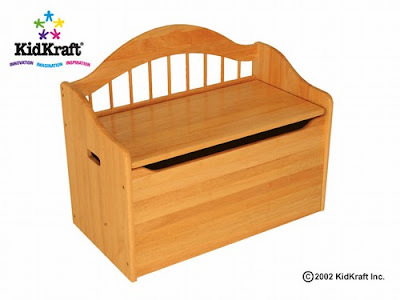 Kidkraft produces a unique line of heirloom-quality wooden children's furniture and toys that is proven child-safe and designed to last. At affordable prices, parents can outfit their children's bedrooms and playrooms on any budget with classic or whimsical furniture and accessories, with engaging toys that help little ones to develop important skills. Here are just some of the quality products Kidkraft has to offer. Tables & Chair Sets - Choose from a variety of classic designs, with natural wood finish or bright, primary colors; your children will love these table and chair sets that are just their size. Toddler Beds - Adorable toddler beds in classic styles or whimsical designs, like Kidkraft's Princess and Fire Engine beds, are perfect for helping your toddler transition from crib to "big kid" bed. Step stools - Help your child get hard-to reach toys or books, and make hand-washing and tooth-brushing easier with Kidkraft's sturdy step-stools. Most stools are equipped with a handy storage bin under the top step - store bath items, toys and more. Toy Boxes - Get rid of the clutter in the family room or play room and teach your child to clean up with kid-safe toy boxes and bins. Designed to prevent pinched fingers and other injuries, Kidkraft toy boxes meet or exceed the safety recommendations of the Consumer Product Safety Commission. Bookcases - Build your child's library and keep books neat and organized with wooden bookcases made to complement any décor. Clothes poles - Coats, hats, sweaters, and more have a place on Kidkraft's attractive clothes poles - help your child develop independence and responsibility for keeping his or her room neat and clean. 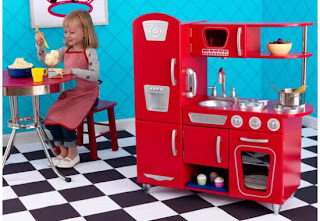 Toy Kitchens - Kids love pretending to whip up a feast or a batch of cupcakes for friends and siblings with these beautifully designed, colorful and realistic toy kitchens. 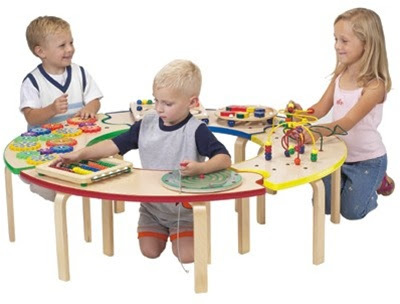 Train Tables and Train Sets - Girls and boys alike will spend hour after hour creating, playing, and rebuilding with wooden train tables and train sets. All tables are compatible with Thomas the Tank Engine and Brio trains. Art Easels - Your little Picasso will feel like a real artist with a free-standing art easel, with accessories, from Kidkraft. Educational Toys - Age-appropriate wooden educational toys can help your child develop important motor and cognitive skills. All toys are non-toxic and lead-free. Vanity Tables - Adorable Kidkraft vanity tables are perfect for your little princess or superstar. You can find all of these fantastic Kidkraft products, along with hundreds of other quality kids' items, right here at A Kid Place. As anyone who spends time with children already knows, kids get restless and bored when they have to wait for any period of time. Whether you are in charge of a doctor's office, dental office, or any other area where children may need to spend time waiting for an appointment, you know how important it is to have toys and other activities available. Here, we discuss the importance of waiting room toys and which products make the best choice for a well-equipped waiting room. Why are waiting room toys important? Aside from the obvious reasons - preventing hordes of screaming, running children from taking over your waiting area and driving other clients or patients away, there are other, more positive reasons for having entertaining and educational toys, books, and other activities to keep children engaged while they are waiting. Children often become nervous and frightened about checkups or dental exams, and waiting for an extended period of time with nothing to do can increase their anxiety and make a doctor's visit an extremely unpleasant experience. On the other hand, if kids know that they will have a variety of interesting toys and games to entertain them while they wait, they become less anxious and may even look forward to spending time in your waiting room. Play cubes and wall panel games - These toys offer a variety of manipulative and problem-solving games to keep younger children occupied, while teaching them at the same time. Tic-tac-toe games, rollercoaster bead mazes, counting beads, sliding puzzles, and matching games are a great way for little ones to pass the time - and there is no need to worry about clean-up at the end of the day. Wooden puzzles - Kids of all ages love puzzles, which are excellent for encouraging problem-solving skills. 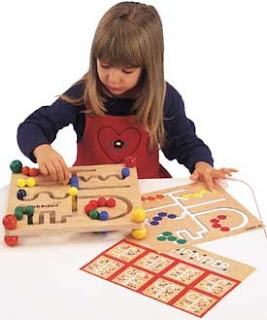 Wooden puzzles designed especially for the waiting room are durable and will last for years of constant use. 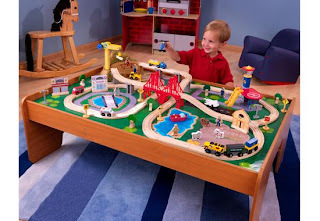 Train tables - What child does not love a train table, complete with tracks, scenery, trains, and people? A sturdy, wooden train table offers hour after hour of creative play. Book shelves or book cases - A sturdy book shelf can hold a selection of books and magazines geared toward a range of age groups; children love to settle down on a caregiver's lap with a good book while they wait their turn. Tables and chairs - Kid-sized tables and chairs make your waiting room a welcoming place and provide a place to sit while coloring or working on a puzzle. Choose chairs and tables in bold colors to brighten up your waiting room. You can find a great selection of waiting room toys and furniture from high-quality manufacturers such as Anatex here at A Kid Place. Each year, dozens of children are injured by toy boxes. Although a toybox is a great way to get rid of play room clutter, there are numerous dangers you should be aware of. The most frequent accidents occur when poorly designed lids close on children while they are searching for a toy; even more seriously, children can suffocate if they climb or fall inside and become trapped. Following these helpful tips can help you find just the right storage solution for your home while avoiding serious injury to your precious little ones. Check for safety hinges and lid supports. The Consumer Product Safety Commission recommends that toy boxes be equipped with hinges that are designed to stay in place at any point to which they are opened. In addition, toy chest covers should have lid supports to prevent them from closing on children as they lean over the edge of the bin. Look for toy boxes with cutouts at the sides and front to prevent pinched fingers. Many toybox injuries occur when the lid closes accidentally on little fingers. A toy box that is designed with cutouts around the top rim will prevent crushing and bruises. Do not purchase a toy box that latches shut. Occasionally, small children may manage to climb or fall into a toy box. To prevent your child from becoming trapped, make sure there are no latches and that the toy box you choose can be opened easily from the inside. You may want to choose a toy chest that has been manufactured with ventilation holes, to prevent suffocation if your toddler does fall in. Make sure the edges are rounded and smooth. Well-sanded, smooth edges and corners help to prevent bumps and bruises as your child plays. Make sure the surface of the bin is polished and free of splinters or paint chips that can cause painful injuries. Purchase toy boxes made with non-toxic materials. While toyboxes are generally made from non-toxic materials, children's products that are manufactured overseas may sometimes contain lead paint and other dangerous substances. Look for a toy box that is certified lead-free. At A Kid Place, you can find a terrific selection of kid-safe toy bins and toy boxes that can hold all of your toys and games. Keep clutter to a minimum with attractive storage solutions designed for every décor. Have you ever walked past a wooden train table display with a small child without him begging you to stop and let him play for just a few minutes? Chances are that if you have a pre-school age child, she has been fascinated with Thomas and friends, or similar train sets, every since she first laid eyes on them. This year, you can make all your little one’s dreams come true with a holiday gift of a beautifully crafted wooden train set and table. Pretend play is so important for small children. It helps them develop in numerous areas, including empathy, social and communication skills, and problem solving. A kid-friendly train set is one of the best ways to stimulate your child’s imagination and provide him with hour after hour of creative play, as he experiments with designing his track setup, manipulates the trains, and cooperates with other children as they play side by side. Train sets and tables make ideal holiday gifts; unlike other toys, which may promptly break or end up under the bed, wooden train sets have lasting appeal. The colorful landscapes, easy-to-assemble track, and charming trains and buildings will hold your children’s attention for years to come. Stay away from plastic train sets. While they generally cost less than wooden trains , they are easily broken and can present a safety hazard. Instead, opt for high-quality wooden train tables and accessories that are manufactured using non-toxic materials. You may pay more, but these toys last for years and are worth the slightly larger investment. Look for wooden tables with non-chip edges; these higher-quality train tables are safer and last longer. The best train tables come equipped with storage bins that slide underneath the table for easy clean-up; get the clutter up off the floor and make playtime more pleasant for both you and your child. You can find a great selection of affordable train sets and tables at A Kid Place. Most of our adorable, well-crafted tables and train sets are compatible with Thomas and Brio trains. To avoid disappointment, make sure you order early to ensure delivery before the holidays. For most little girls (and many grown-up ones), there is something magical about a dollhouse. A miniature house stimulates the imagination like nothing else, allowing your child to create her perfect dream world. You can help make her fantasies a reality this holiday season with quality crafted dollhouses for children of all ages. Before you make your purchasing decision, here are some of the things you should consider about choosing the right dollhouse for your child. Before you choose a dollhouse for your child, the first consideration is whether or not the toy is appropriate for her age and ability level. Safety should always come first, so choose a simple design with just a few rooms for your toddler. Furniture and “people” that are easy to grasp and do not pose a choking hazard are the best bet for your smaller child. On the other hand, for older children, the sky is the limit. A beautiful Victorian, a modern Barbie townhouse, or a miniature dollhouse is equally appropriate for bigger girls. Dollhouses can be relatively simple or superbly detailed; remember to take the age and preferences of your child into consideration. For younger children or those who tend to “want it now,” a fully assembled dollhouse is your best option. As soon as she receives her toy, she will be able to begin playing for hours of creative enjoyment. However, for girls who are “crafty,” building a dollhouse from a kit can be an enormously satisfying experience. Assembling a dollhouse from a kit lets her take charge of the construction from beginning to end, personalizing her house with the colors and decorations she prefers. Putting a dollhouse together is an excellent family project, as well, allowing you to spend hours of quality time with your daughter. Some dollhouses can be purchased fully furnished; with others, the details are up to you. For younger children, it is usually best to look for a complete dollhouse set with a few, simple furnishings and accessories; for the dollhouse hobbiest, adding a few carefully chosen pieces at a time can make a dollhouse a project that will last for years to come. Whatever size and type of dollhouse you choose, it is sure to be a gift that will be remembered for a lifetime. 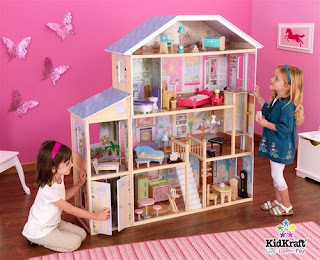 Make this holiday the best yet with a beautifully crafted dollhouse from A Kid Place. The name Guidecraft is synonymous with quality and fun. For decades, the Guidecraft company has been manufacturing the finest wooden children’s furniture and educational toys. This family-owned company is noted for providing the best quality and service to increasing numbers of loyal customers. Here are just some of the wonderful kids’ products from Guidecraft. Guidecraft children’s furniture is made from quality hardwood in a variety of charming styles; choose from classic designs, whimsical hand-painted creations, and even MLB-themed playroom furniture. * Classic - Guidecraft offers a great selection of kids' tables and chairs, step-stools, and more in a variety of classic styles and finishes to suit every decor. Outfit your child's bedroom or playroom with these sturdy, adorable pieces. * Hand Carved and Hand Painted - Whimsical tables and chairs, toy boxes and more are lovingly painted in themes that will delight children of all ages. Pirates, safari animals, and a farmhouse design help bring your child's fantasies to life. * MLB - Major League Baseball team designs bring out the team spirit in any sports fan. Root for your favorite team with Guidecraft's rocking chairs, book shelves, and table and chair sets. * Storage Solutions - Home and Classroom - When playtime is over, cleanup is easy with toy boxes, storage bins and more. Handy step-stools with storage space inside are perfect for the playroom or bathroom; for teachers, organizing the classroom is a cinch with bookshelves and storage shelves in attractive colors and designs. Educational toys from Guidecraft help your child to develop a wide range of important skills, from color and shape recognition to organizing and sorting to communication. These exciting and engaging toys are sure to appeal to young children. * Classic Manipulative Toys - Manipulative toys like shape sorters, puzzles, or lacing games help children to develop their motor and problem-solving skills, as well as learning about their relationships to their environment. Guidecraft offers a great selection of colorful, non-toxic toys that are perfect for the playroom or pre-school classroom. * Wooden Blocks - Your little architect can put her imagination to work through creative play that encourages coordination and problem-solving with classic wooden block toys. * Dramatic Play & Dress-Up - Dramatic play encourages cooperation, communication, and creativity; encourage your child's imaginative role play with play kitchens, wooden puppet theaters, and dress-up solutions for the home or classroom. * Magneatos - Guidecraft's award-winning Magneatos construction toys are fun for kids of all ages. The oversized magnetic pieces are safe even for younger children and encourage hours of creative play. 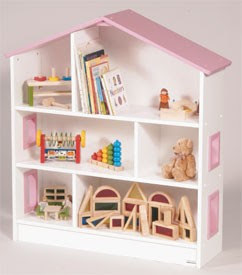 Here at A Kid Place, we have a fantastic selection of Guidecraft’s high-quality wooden children’s toys and furniture. Find everything you need to create memories that last a lifetime this holiday season.